At the dawn of the final decade of the nineteenth century, three passages had been developed for maritime traffic making between the Straits of Mackinac and Green Bay, with the route selected by mariners dependent on weather conditions and final destination. The North Passage led almost directly west out of the Straits, guided by lightship LV56 on White Shoal and the coast lights on Squaw Island and Seul Choix. 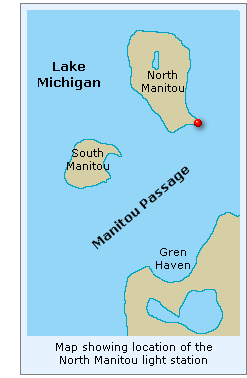 The central route passed between the lights on North Fox and Beaver Island, and the third passage led between North Manitou and South Fox. While the light station on South Fox had served to mark the north side of the passage since 1867, without a light in North Manitou Island, the southern boundary of this 17 mile wide passage was as yet unmarked. In view of the immense trade passing through the area, the Lighthouse Board recommended in its annual report for 1892 that Congress make an appropriation of $20,000 to establish a light and fog signal on the north shore of North Manitou Island to adequately light both sides of the passage. While Congress passed an act approving the establishment of the new station on February 15, 1893, it neglected to follow up with an appropriation for the necessary funding, and the Board reiterated its request in its two following reports. Congress finally appropriated funding on March 2, 1895, and a survey party was dispatched to the island to select an appropriate site. While the Board's recommendations clearly stated that the new light should be established on the north shore of the island, for reasons we have yet been unable to determine, a site on the island's southernmost prominence known to islanders as "Dimmick's Point" was instead selected for the station, and negotiations to obtain title to the selected site were undertaken immediately. However, the owner of the selected was evidently unwilling to sell, and condemnation proceedings were initiated by the US Attorney in September, 1895. Plans and specifications were drawn up for duplicate fog-signal boilers and machinery that winter, and bids opened for supplying the equipment on April 15, 1896. The contract for supplying the machinery was awarded to Kingsford Foundry & Machine Works in Oswego, New York, who began work on the equipment immediately. Work then began on planning the station structures. Rather than create a new set of plans for the dwelling and fog signal building, Ninth District Engineer Milton B. Adams apparently decided to use plans that had been developed for similar structures the previous year on Plum Island across Lake Michigan. In 1896, Major Adams was serving as Chief Engineer in both the Ninth and Eleventh Districts, and was already working on a design for a radical new type of cylindrical iron tower for incorporation into new stations planned at the entrance to Sturgeon Bay Canal on the west shore of lake Michigan and at Devils Island on the south shore of Lake Superior. These new towers consisted of a simple iron cylinder, and were designed to be largely self supporting, the central cylinder served both as the primary support for the light as well as a housing for the spiral stairway contained within. 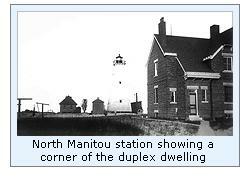 Thus, initial plans for North Manitou station included a tower of similar design. The contractors began work on the station structures in August, 1896 with work progressing quickly. The red brick fog signal building stood 40' 1" in length, 22' 6" wide, and its walls 12' 6" in height at the eaves, supporting a hipped roof sheathed with corrugated iron. The two-story dwelling, also of red brick, was erected over a full cellar with walls of cut limestone, and was capped by a red-painted tin shingle roof. The interior of the structure was configured as three separate living quarters, with the Keeper occupying both floors in the south half of the building, the First Assistant the first floor of the north half and the Second Assistant a similar area on the second floor immediately above. Entrance to the keepers quarters was gained through a door on one side of the dwelling, with the Assistants sharing a door on the opposite side. The interior of the building was universally accepted as being the most opulent ever built on the island, with entry foyer floors laid with ceramic tile and fine varnished oak millwork throughout. All quarters featured built-in oak cabinetry including glass-fronted china cabinets in the dining rooms. The Keepers quarters even featured pressed tin ceilings in the parlor and dining room. With the erection of a pair of privies, work on the dwelling was considered complete. Work on the fog signal building was completed in October, just in time for the arrival of the lighthouse tender AMARANTH with the necessary fog signal equipment. Over the following month, twin marine boilers were secured to concrete pads which had been prepared prior to their arrival. Each horizontal marine boiler was equipped with 4" diameter horizontal cylinders with a stroke of 9", designed to provide an operating steam pressure of 90 pounds per square inch. Each of the engines was plumbed to its own 10" whistle mounted atop the roof, and the boilers piped to a pair of 20" diameter steel chimneys rising through the roof to a total height of 32' 4" above the foundation. Installation of the north signal was completed and the unit tested and placed into operation on November 20th, 1896. A 6' by 6' red brick 360-gallon capacity oil house and a 16' 4" by 36' 4" buff-painted board and batten boathouse completed the complement of station buildings. Construction at the station was completed in December, just in time for the crew to depart with the onset of winter. For reasons that we have yet to determine, plans for erecting the planned iron tower at the station stalled in 1897. Whether it was a result of vibration problems being experienced with the similar tower at the Sturgeons Bay Canal station, or a lack of sufficient funds remaining from the appropriation, the North Manitou light station was operated as a fog signal station only during the 1897 navigation season. Late that year, plans for the iron tower were abandoned, and the decision was made to erect a timber pyramid tower at the station, and contracts was awarded for furnishing the required materials and a circular Fourth order lantern. A work crew again arrived at North Manitou in July, 1989 and began work by leveling the selected tower site and erected eight concrete pads which would serve as the structure's foundation. On these pads, the framing of the tower was erected using 14" square timbers. The pyramidal open frame timber structure stood 24' 8" square at the base and tapered to 10' 4" beneath the gallery. The upper level of the structure was enclosed with clapboards to cerate a service room in which to clean lamps and store supplies. A square southern white pine gallery 14' square was installed above the service room, and a circular lantern 7' 8" in diameter with diagonal astragals erected at its center. The district Lampist arrived at the station, and carefully uncrated the station's new Fourth Order Fresnel lens which had been manufactured in Paris in 1896 by L. Sautter et Cie., and shipped to the station by way of the central depot in Staten Island and the district depot in Detroit. After the components were carefully carried into the lantern, the lens was assembled on a 20-ball bearing raceway atop the pedestal. Designed to exhibit an alternating red and white flashes every ten seconds, the six panel lens was outfitted bulls eyes on each panel. Power for rotating the lens was provided by a fan regulated clockwork mechanism connected to the lens by a series of gears. A steel cable was wound around a drum within the clockworks, with the cable routed through the lantern floor and around a pulley and thence vertically within the open structure of the tower interior, and a heavy weight attached to the lower end of the cable. This weight slowly dropped down, turning the drum, and thereby rotating the lens. Ruby glass panels were fitted to the outside of the lens to impart the alternating red flashes, The new light was exhibited for the first time on the evening of September 15, 1898, and by virtue of the tower's location atop a slight rise, the lens sat at a focal plane of 70 feet above lake level, and was visible for a distance of 16 miles in clear weather. In the summer of 1899, the lighthouse tender AMARANTH returned to the station with a working party and materials to complete the station. After sheathing the entire exterior of the skeleton frame tower with clapboards, a lightning conductor of 3/16" by 1 ½" copper was attached to the lantern, and stapled down the clapboards to the ground, where it was buried deeply enough to contact moist ground. The boat landing was extended an additional 55 feet, 644 feet of plank walks were laid from the dwelling to the boathouse, and a 60 foot flag pole erected in the middle of the station grounds. 1899 was likely a memorable year for the North Manitou keepers, as they fed 88 cords of wood into the hungry fog signal boilers to keep the whistle screaming its warning across the Manitou Passage for a station record 757 hours. Judgment was finally rendered in the District Court for the condemnation of the lighthouse site on January 23, 1899, and with a fair value of $487.41 determined for the property, a like sum was deposited by the Government with the Clerk of the court on February 25. The following year, the boathouse was moved to the opposite side of the Dimmick's Point and a new plank walked laid to the dwelling. While on site, the crew also erected a 24' by 28' foot timber-framed barn and a woodshed before the crew departed for work elsewhere. Three years later, the plank walkways within the fenced-in section of the station were replaced by 641 feet of concrete paths and a new landing was placed beside the boathouse. Life at the isolated station was not without its hazards, as witnessed by a close call that Keeper Edward Cornell experienced in 1910. It would appear that the gas tank in the keeper's boat developed a leak, and forced to make repairs at the station, Cornell decided to solder the leaking seam. Unaware that the tank still contained a residual amount of gasoline, the blowtorch he was using for soldering ignited the fumes, resulting in a huge explosion which set fire to the boat, fracturing the bones in his right ankle. Mustering a Herculean effort from within his fog of pain, Cornell managed to extinguish the fire around him before dragging himself onto the landing. While after Cornell was taken to the doctor in Leeland he managed to continue his duties with the aid of crutches, it was months before he fully recovered the use of his right ankle. Also that year, with the completion of the new light at White Shoal, lightship LV56 was moved to mark the southern limit of North Manitou Shoal. 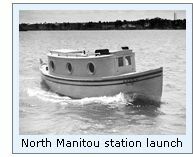 With the lightship now marking the north side of the passage, the days of viability for the North Manitou station were inevitably numbered. Waves driven by stiff offshore winds frequently dashed their way across Dimmick's Point, and the keepers had grown used to lake water moving close to the station at times. 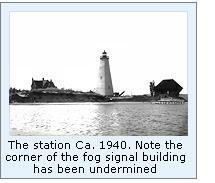 However in 1912, currents and wave action became so strong that they found water lapping at the foundations of the fog signal building. After learning of the news in Detroit, am engineer and construction crew was dispatched to North Manitou and five spur cribs were erected to help stabilize the eroding shoreline. Apparently, the cribs served their function, as sand quickly began to accumulate up in the lee of the cribs, and by the end of the year there was a full fifty feet of beach restored between the station buildings and the water's edge. On April 24, 1916, the station's oil lamp was replaced with an incandescent oil vapor system, which increased the intensity of the white light to 24,000 candlepower and the red flash to 7,200 candlepower. The light was automated in 1928 through the installation of sun valve equipped acetylene-powered light. However, with the establishment of the North Manitou Shoal Light to replace the lightship in 1935, the North Manitou Light station had outlived its purpose, and the acetylene light was discontinued. The entire lighthouse property was subsequently declared surplus and sold at auction to Lansing businessman William Angell for $2,600 in October, 1938. Without constant painting by crew of dedicated keepers, the wooden tower and out buildings quickly faded from their crisp white appearance to a dull silvery-gray, and without continued shore protection, the waves began to reclaim an increasingly large expanse of beach in front of the station. Before long, the water was again lapping at the foundation piers of the tower, and thus compromised, the tower crashed to the ground in October, 1942. Click here to see a complete listing of North Manitou Island keepers compiled by Phyllis L. Tag of Great Lakes Lighthouse Research.